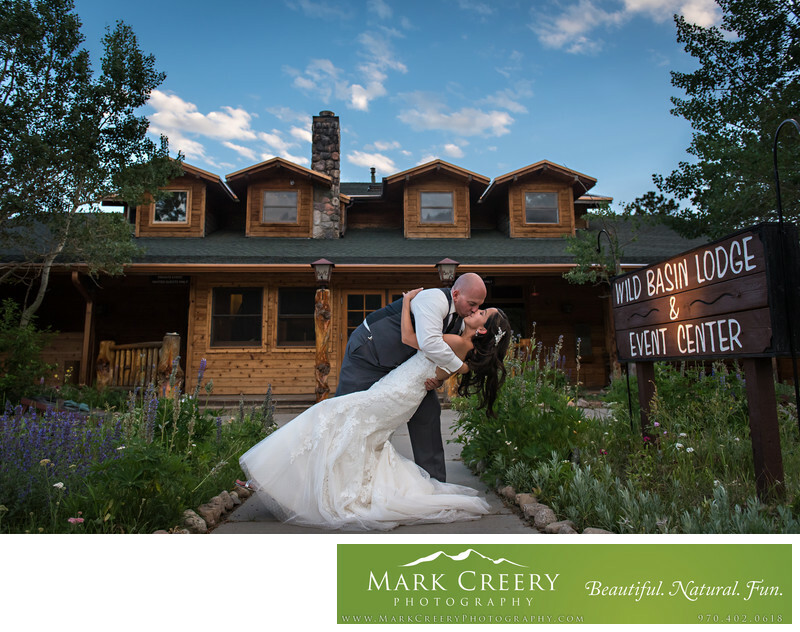 In this portrait taken in front of Wild Basin Lodge at dusk, the groom dipped his bride for a dramatic look. This image connects the couple to the venue, as it highlight the site's welcoming sign, the lodging and it's rustic look, and the Colorado blue skies. The couple had an amazing time at their wedding, and the venue played a part in that. With hummingbirds buzzing around their feeders on their decks in the summer, it is a magical place. They had fun games for guests to play out front during their portraits, as well as a photo booth area where guests could dress up and get silly. Wild Basin has so many outdoor wedding photography options that I love. Couples can choose from two ceremony options - one an amphitheater with great views of a rapidly-flowing river, green aspen trees in the summer and golden leaves in the Fall, with mountains all around. The other option is an open field with rustic wooden benches and a wider view of the mountains, and is a 5 minute walk from the venue itself where you cross the river on a bridge. Wild Basin Lodge and Event Center is located in Allenspark, Colorado. Contact person: Christina, (303) 747-2274, sales@wildbasinlodge.com.